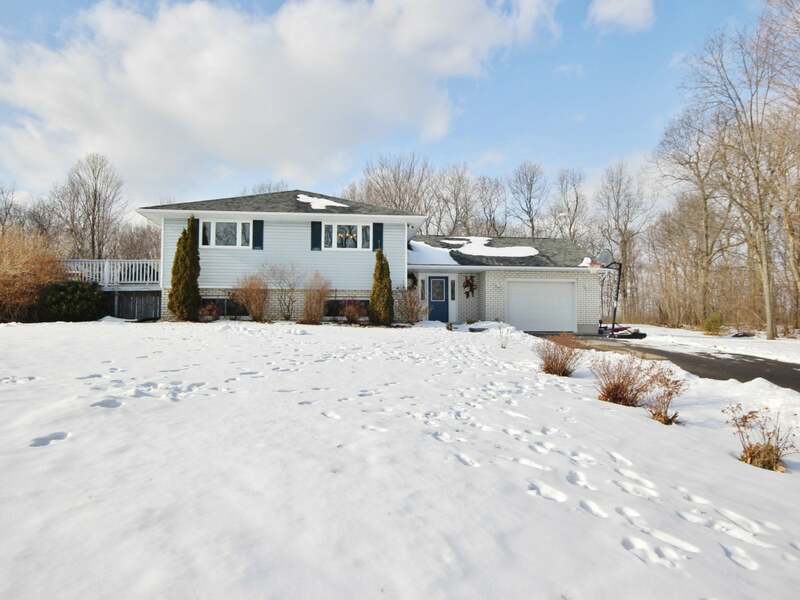 Beautiful country bungalow set on a picturesque 1 acre lot just 10 minutes north of the 401. 3+1 bedrooms, 2 full baths and featuring oversized tile foyer, gorgeous pine floors, extensive crown mouldings, spacious living room filled with natural light, large country kitchen with built-in appliances overlooking dining room with garden doors to huge two-tiered deck, above ground pool and beautiful treed back yard, ideal for entertaining. 3 large bedrooms up, 4-piece main bath with jet tub and main floor laundry. Fully finished lower level with large windows, laminate flooring, huge rec room with pellet stove, additional guest room, den and 4-piece bathroom. Attached garage, updated high efficiency propane furnace, updated roof shingles, central air, paved driveway with turn around and more! An absolute pleasure to show, call to arrange a private viewing. Lot Size 150 x 300 Sq. Ft.